08/04/2001 : Somehow, the heat in Yoyogi’s stadium was like the one in Kuala Lumpur, and Roslin Hashim could feel just like at home to play his third consecutive semi-final after the All England and the Swiss Open. Stopped at this stage in Birmingham, the Malaysian went all the way in Basel, and is now ready to take the Japanese crown. His match against Shon of Korea was quite a good challenge and a good warming up for today’s final. Changing the pace of the game while in danger – he was trailing during the first part of the second game - Hashim proved to be very fit, lightfooted at all times. “I feel very confident with my game since the Korea Open. I still consider myself as an underdog so that I don’t feel pressure, and I just go out and give my best on court,” said Hashim. Now world number three, Hashim didn’t expect to be reaching his goal so early in the season. “I just wanted to stay in the top ten until the world championships. I have been practising very hard in Malaysia, and the kind of training suits me very well. We learn to play different styles to be able to change our game depending on our opponents,” added the 25-year-old Malaysian. And he will need to change the pace of the game in the final, where he is to meet a very impressive Lee Hyun Il. The Korean made very few errors and played an almost perfect game against Chen Hong of China. He had the defence that Peter Gade was missing in the previous round, but he also had the energy to keep the Chinese running. “I tried to make him visit the four corners and prevented him to smash too often,” said a delighted Lee, whose world ranking will probably improve a lot in the near future. Both men had met earlier on this year in the Korea Open, where Lee had beaten Hashim. In the first game, the Chinese took some time to get used to Mori’s game, made of quick jumps and smart cross court defences. Zhou led 7/3 in the first game, but thanks to her pugnacity and strong will, Mori managed to get back even 9/9. A few times, she fooled Zhou at the net, pretending she was going for the kill and held back her stroke at the last minute for a drop shot winner. The crowd was delighted. Mori saved three game points on inspired deception shots to prevent her opponent from taking the attack. “I tried to get the shuttle away from her because she had such a wide reach and powerful smash,” said Mori. But Zhou scored on the fourth game point. The second game lasted less time, as the Chinese found her normal pace – she usually starts off slowly in big matches – while Mori paid off her efforts of the first game and the match of the previous day against Chen Wang. “This was a good tournament for me, and I have gained confidence for the future. I know that I can beat top class players now,” said the 51th ranked Japanese. Zhou Mi explained that today’s match was much closer than all the previous ones and that Mori troubled her with her fighting spirit. “I tried to kill the first game too quickly, and I started making mistakes, so I changed my mind to be more patient. It paid off in the second one because Mori had lost some energy,” she said. The other semi-final was an all Chinese battle between Gong Ruina and former world number one Zhang Ning who had waited for a long time to play again at a high level: she had been frustrated after the ‘99 World Grand Prix Finals not to be sent away by coaches as her compatriots took all the attention for the Olympic qualifications. Yet Zhang will have to wait a little longer to see her name put on the winner’s list of the Japan Open. 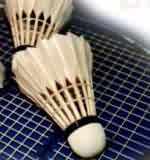 She was beaten by her compatriot 13/11 – 11/4 after missing one game point in the first game. “I don’t like to play against other Chinese players because we know each other so well. The match just goes to whomever makes the fewer errors, because we use the same tactics,” said Ruina. Yet another Chinese confrontation lays ahead of her. “For tomorrow, it will be 50/50”. The odds are in Zhou’s favour, as the latter won the last four encounters in their 10 head-to-heads. No rematch in the men’s doubles event for Tony Gunawan, Halim Heryanto , Sigit Budiarto and Candra Wijaya, as the four Indonesians won’t be able to compete against each other as they did few weeks ago in the final of the All England. The fault is Lars Paaske and Martin Lundgaard’s. The Danes played a very intelligent game, changing tactics after they lost the first game to Gunawan and Heryanto. They had lost severely against the Indonesians in Birmingham, and started playing at net level, which obviously confused their opponents. A smart move which pushed Gunawan and Heryanto to play mostly defensive strokes while the Danes came inside the court. Playing more simply but as efficiently, Lundgaard and Paaske won the second game and made the All England winners doubt in the third one. Leading 5/1, the Danes took some pressure off their opponent, which helped them back into the match to 6/6. But they didn’t want to miss the opportunity of being in a 5* grand prix final: they kept the shuttle low and Martin Lundgaard’s powerful smashes did the rest: The Danes finally won 6/15 – 15/7 – 15/10. In the other men’s doubles semi-final, Sigit Budiarto put on a one man show, as he likes to do, using some of his reflex defence shots to gain the public’s favour. In very different type of rallies than in the other semi-final, both teams were up in the air or very low in the ground for acrobatic points. The Malaysian Chew and Chan had their chances when leading 6/2 in the second set, but their attacks had to be perfect to score, which led to some unforced errors. The Indonesians then took the lead until the end of the match winning 15/8 – 15/11on a last point where Wijaya put pressure with his back hand progressively coming to the net to finally go for the kill. Gao Ling wanted to keep some energy for the mixed doubles, and didn’t spend much time on court with partner Huang Sui. They easily beat Chien and Cheng from Chinese Taipei 15/3 – 15/2 in just over 20 minutes. They will meet compatriots Yang and Huang, who had some trouble getting over their younger training partners Wei and Zhang. Indonesia will have one of their two pairs to play in the final of the mixed doubles as well. If Vita Marissa and Nova Widhianto logically fell to Liu and Chen of China, Bambang Suprianto and Minarti Timur beat the Olympic Champions Gao Ling and Zhang Jun in the last – but not least - match of the day.